Are you tired of seeing your Facebook news feed filled with inane app and game updates, personal posts from people you haven't spoken to since high school, and generally bland content? If so, it's time to spice up your news feed to make sure that you get regular updates from people you care about, as well as news and information on topics you're interested in. You actually have a surprising number of options to improve your news feed--such as editing your friends list, adding interests, using the Like button, and hiding the stuff you hate. Priming your news feed will take a little work on your part, but if you're a Facebook fan and you want to improve your feed, here's what you need to do to take Facebook to the next level. 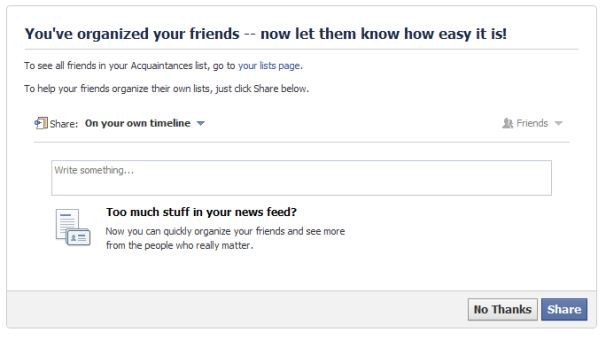 Facebook lets you classify your friends as close friends or acquaintances. Classifying people as acquaintances can improve your news feed, since you'll lose the annoying daily updates from people you haven't spoken to in ten years. You'll still receive updates from acquaintances, but only the important ones. Facebook has an automated tool that helps you organize your friends list into close friends and acquaintances, so you don't have to go through your pals one by one. The tool automatically generates a list of friends that it thinks are your acquaintances, and asks whether you'd like to see less of them in your news feed. Although Facebook does a pretty good job of weeding out acquaintances based on the people you do and do not interact with, you should check the selections to make sure that a close friend doesn't slip through the cracks. You can run the tool as many times as you wish to keep tweaking your news feed until you run out of friends to add to your acquaintance list. If you're still getting unwanted updates from people after running the friend organizer tool, you can quickly get rid of them. Let's say you want to silence Frank because he posts too many game updates. Hover your mouse over Frank's offending post, and click the downward-facing arrow in the upper-right corner of the update. From the drop-down menu, select Only Important, and Frank's FarmVille updates will instantly disappear. Your Facebook profile has a feature called Interests that lets you subscribe to general categories such as photography, technology, or design. Each category contains people, fan pages, and brands on Facebook that relate to that particular interest. If you subscribe to the interest "Chefs," for example, you'll see public updates in your news feed from 25 famous chefs, such as Anthony Bourdain, Cat Cora, Jamie Oliver, and Wolfgang Puck. To spice up your news feed with Interests, go to your Interests page and click +Add Interests in the top-right corner of the center column. 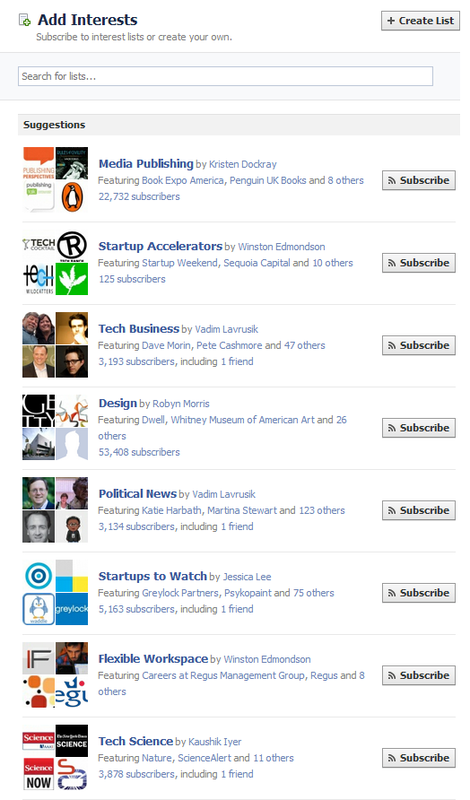 On the next page you can browse through popular lists created by other Facebook users. If you don't find something you like, you can make your own list by clicking +Create List in the top-right corner. Interest-list updates usually clump together as two or three updates from different people on the list at once. Blogger Robert Scoble, who has been advocating some of the methods in this article for several months, points out that Facebook Interests are a great way to get news and information from people you don't care enough about to subscribe to, but from whom you would still like a few updates every week or so. Another way to add interesting items to your Facebook news feed is to "Like" stuff. The items you Like can include brand pages, such as that of PCWorld. If going through Facebook to find things to Like is too much work, just keep an eye out for Like buttons as you travel around the Web. The key here is to Like entire brands or websites, not just articles; doing so will add more updates you're interested in directly from a personality or brand. 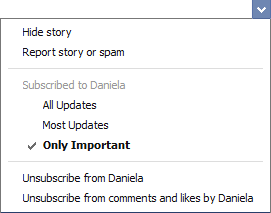 Not only can you add stuff to your news feed to make it better, but you can also subtract items from your news feed. The best thing to do is to eliminate specific types of updates that annoy you--for me, it's the never-ending stream of gaming updates. The easiest way to zap posts like this is to strike them down where they stand. Let's say that updates from friends playing CityVille are driving you bananas. Hover over a CityVille gaming update, and click the down-facing arrow in the top right of the status area. At the bottom of the drop-down menu that appears, select the option that says Hide all by CityVille. By default, Facebook shows you only what it believes are the most relevant items from friends, Interest lists, and Likes. This is Facebook's curated news feed, which is based on various factors such as your relationship to the poster and the popularity of the post. If you'd rather see the latest updates--regardless of popularity--click Sort at the top of your news feed and select Most Recent from the drop-down menu. Facebook will remember your choice the next time you return. Facebook's Ticker on the far right of the screen shows you the latest updates, comments, and activity from your friends in real time. It's a perpetual stream of information that can cause social networking overload. Give yourself a break and banish the ticker in one of two ways. The first way is to go to the bottom-right corner of your news feed and click the right-facing arrow and square bracket symbol to hide the sidebar. The downside of this method is that it hides your Facebook chat window as well. Alternatively, you can adjust your chat window to cover up the annoying ticker. To do this, hover over the divider between your chat contacts and the ticker. When you see the double-edged arrow, just click and keep scrolling up until the ticker disappears. Connect with Ian Paul (@ianpaul) on Twitter and on Google+, and with Today@PCWorld on Twitter for the latest tech news and analysis.